Here's is a good article that talks about the manufacturing practices of TREK bicycle corporation, particularly that for making and cutting the complex shapes found in TREK frames. For example, TREK uses multi-axis laser cutting for its frames, and all cutting along contours are preprogrammed and managed by a software. The flexibility offered by the software and the time reductions help TREK to make changes to their design and implement those changes quickly. Lead times are less. Today's machines are very complex and able to do a lot of things that in the past required multiple machines. Examples are 5 axis milling and turning centers that comprise of a variety of tools and changes between tools are quite quick. These machines enable companies to come up with the complex shapes we see in some of the designs out there, far more quickly and accurately than before. 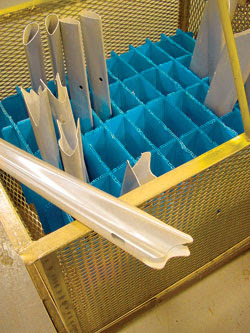 They save costs in molds, scraps and other painstaking setups to get the work done right. I've always been interested in studying how such a high volume company manages its operations. While there are plenty of sites out there offering pictures of TREK factory tours, none really talk about the layout of the factory, how frames are cut, what machines, CAD/CAM, and automation techniques are used, how many frames are made in a day, week etc. I'll be keeping an eye out for these. Manufacturing practices of big bicycle companies are quite relevant to this blog. Its aids in my own study of flexible and automated manufacturing practices in today's world. Few of us really appreciate the engineering going on behind top end frames. I'm not going to be one of them. With the goal of “Building the Best Bicycles in the World,” a Wisconsin operation employs a powerful CAM program to precisely cut high-end alloy and carbon fiber composites with a multi-axis laser. Trek Bicycle Corp. (Waterloo, WI) produces bike frames at the rate of about 300 metal –aluminum, titanium or steel – frames a day, and nearly that number in carbon fiber. The frames are then sent to another plant for assembly into a bicycle. Last year, 13 new models were designed and produced in titanium, steel or aluminum metal with an average of seven different sizes of each. Product life is usually only about two years before one model is replaced with a new one. With this schedule, Trek manufacturing engineers face at least two challenges: keep up with design changes and keep up with volume, while assuring a high quality fabrication and finish. Some of the frames are like no others, designed to minimize wind resistance, while providing proper rigidity and looking cool. These characteristics make Trek bicycles popular worldwide and the choice of Tour de France champion Lance Armstrong. To accomplish their mission, Trek engineers are using Delcam (Windsor, ON) PowerMILL 5-axis version to program a multi-axis laser to cut the tubing for the high-line bicycles. PowerMILL is a world-class NC CAM software for the manufacture of complex shapes typically found in the toolmaking, automotive and aerospace industries. Key PowerMILL features include a wide range of cutting strategies, including 5-axis cutting techniques. Exceptionally fast calculation times and powerful editing tools for the software help ensure optimum performance of the machine tool. At Trek, engineers use PowerMILL to program 4-axis laser cutting of frame tubes. All aluminum, steel and titanium frames manufactured in the Waterloo facility cross the laser tube-cutting machine. The challenge for manufacturing is to keep the beam normal (perpendicular) to the part surface or it will be deflected to other parts of the room – dangerous as well as ineffective. “Even though the Z positioning of the laser is automatic to assure correct focus, we still have to follow X, Y and rotation. That’s a challenge on a sloping surface, which is the nature of the tube profiles these days,” notes Garner. “Calculating X, Y and rotation to prevent deflection of the laser is extremely important in order that the laser follows the contour of the part. If you are off just a little bit, working with 3-dimensional space, you could ruin the spline – and the material is costly. PowerMILL made it possible to cut the shaped spline to fit the joining piece with no gaps,” Garner says. In using CAM software to program a part, the operator chooses the application, the part number (SKU) of the frame, the size, which version, how many points around tube and other details. “Once we decide how we want to cut it, PowerMILL generates the tool path around the part without us having to do anything else,” Garner adds, noting that an especially helpful capability of the software is that it calculates the transition point between the inner spline and the outer spline, allowing Trek to manufacture a smooth interface between frame components. There are seven to 15 laser programs per frame. Most of the tool path calculations, which the shop would have had to do manually, the CAM program now does automatically. “All we have to do is setup the frame model in our desktop computer so PowerMILL can find the ends of the spline tube and generate a tool path for the laser,” Garner says. “Each size frame may have upwards of 15 different programs to complete it. And each frame set will have 3 – 15 sizes. And since PowerMILL breaks the tool path into pieces, we can select a section and modify or delete as needed to optimize the program and avoid having to run and revise the whole code – a major advantage with the product changes we normally see. “Once the tool paths are created, we can post that code to a program for a laser. Once posted, it shows how the laser will respond to what we have just done. If we like it, we can run that chunk of code,” Garner points out. 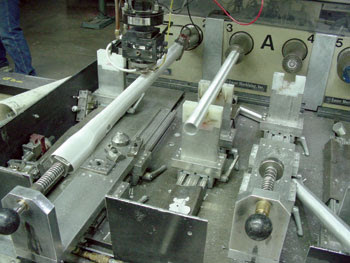 The automated post processor added by Delcam VAR Programming Plus, Inc. (New Berlin, WI) speeds programming time, helping Trek keep programming time per tube in the 10-minute range. Some of Trek’s frame tubes would otherwise probably take about 30 minutes to program, Garner explains. The CAM program is also a big help while Trek is in the validation stage and proving out a bike concept. At this point, geometry, dimensions or other specifications may change after a few test rides. “That means we in manufacturing have to go back and re-program our laser code. We sometimes may have 4 – 5 iterations before we are ready for production. But because we are holding tighter tolerances, the number of iterations is being reduced, resulting in faster time to market,” Garner advises. Today, Garner’s team programs the laser to chase some very tight corners on the new complex tube cross sections. “With PowerMILL we are getting a much tighter fit, piece to piece, and minimal gaps, if any, which means we can hold our overall frame geometry much better. Parts normally shrink as we weld them, and with a gap, shrinkage is much more uneven or random.” Compared to its previous CAM techniques, gaps between parts before welding could have been 1 mm or more. “Today, it is rare to see a gap greater than 0.1 mm,” Garner says. The closer tolerances mean a better fit-up, which makes it easier and less time-consuming to put the frame together. A looser fit takes more time to bring together. Difficulties in fit-up may be half of what they used to be, according to Garner. PowerMILL has played a key role in helping Trek stay ahead of the pack with quality, design and short time-to-market with some of the most sought-after bikes available. And other applications are on the horizon at the company. “We have worked out other potential uses for PowerMILL, such as making die sets for producing the carbon frames, which saves us up to $30,000 each,” Garner adds. “Now we can do them in-house with better results.” Delcam, Inc.